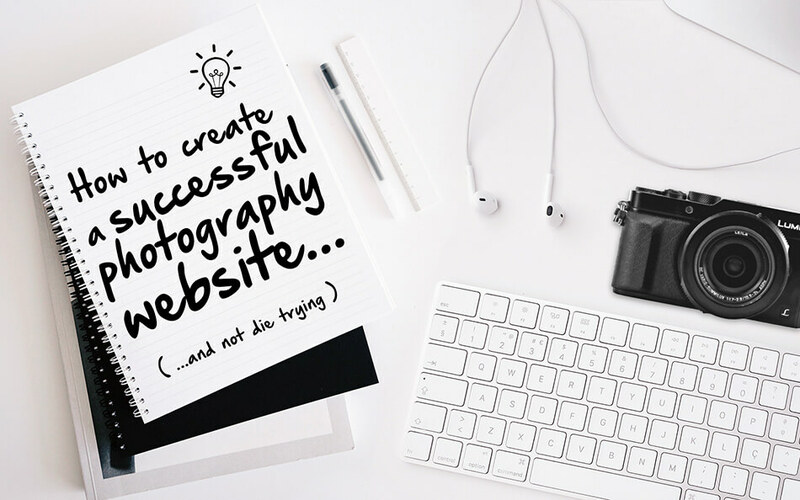 💡 How to create a successful photography website - Arcadina - Webs para Fotógrafos y Creativos. - Arcadina - Webs para Fotógrafos y Creativos. What are you waiting for? Get maximum benefit from your photography website. 5. Promote your photography website with your Blog, social networks and a good web ranking. Do you need to create a photography website? Today, it is pointless to create a photography website that only displays some of your sessions. You need to keep in mind how to attract visitors to your photography website. In order to do this, you need to know your potential client fully and be able to answer their questions within your photography website. For example, if one of the daily enquiries you receive is finding out about your fees, don’t be afraid to include them in your photography website. Nothing awful will happen if you do. Or if you feel that your future clients need to get to know you a little more, on your about me and services pages, tell them what you are like and how you work, or you can even upload a “making of” video of you working or explaining your sessions. Another important thing to keep in mind is testimonies. Ask your clients to evaluate your work and add their comments to your photography website. This is extremely valuable social evidence of your abilities. Lastly, your photography website should display your best photographs and videos, but don’t put them all on, just a selection that defines the type of work that you want to be contracted to do. Don’t put photographs of products on the website if you want to focus your photography business on weddings and children. Watch this video, in which our collaborator Jon explains in great detail how you should create an online photography portfolio. 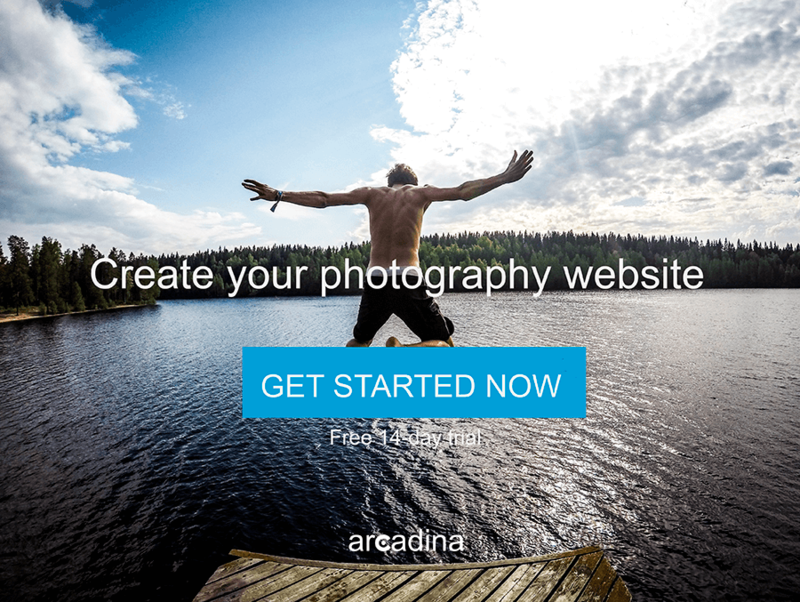 Below, we provide 8 extra pieces of advice so that you can create your photography website with Arcadina and make it profitable. This will be the first, and one of the most important decisions you take before creating your photography website. What is the name that you want people to remember you by? Apart from choosing a domain name that is both elegant and unique, you should try to have one that represents you as a brand. This decision will be the start to creating your seal of identity. The name will always be associated with your images and with the way you work. So take your time and think of an appropriate domain name for creating a photography, video or creative website. It may be that you are also interested in a Premium photography domain name with a novel extension such as .photo or .wedding, among many others, which would also reinforce your brand. As opposed to many other platforms, at Arcadina we include the domain name in all our price plans. If you have any questions about the subject of domains, we have included some articles below. Otherwise, just ask us and we will resolve all your doubts in less than 24 hours. 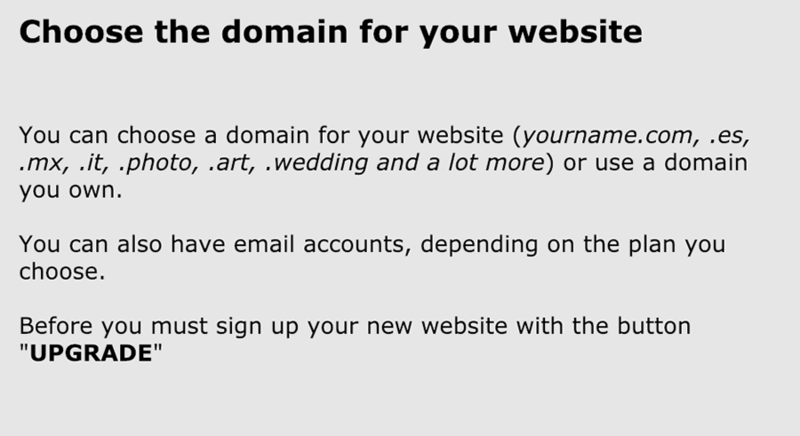 >> Choose the domain name you want for your website with Arcadina. >> The best domain names for photographers and creatives. 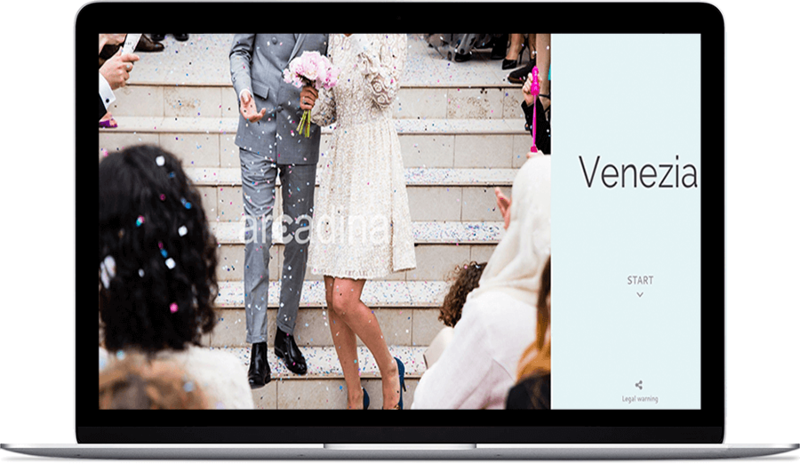 At Arcadina, thanks to a wide variety of website designs created for photographers, videographers and creatives you will be able to choose the design that best adapts to your photographic style. On average, our clients have their photography websites ready and published in just 2 days. There are even some users who have published their photography website just a few hours after registering on our platform. Here are some examples of the photographers who have relied on Arcadina. >> Examples of photography websites created with Arcadina. >> Create your photography website in less than 1 minute. When personalising your website menu, keep it simple. Use as many sections as necessary so that your visitors can find all the information they require quickly and in an organised manner. If you are innovative in this, and use unusual names or convoluted pathways, your visitors will not be able to understand what is behind those sections and will leave your photography website without discovering your talent or business offer. You should also be aware of how your website can be viewed on mobile and other devices (tablets), as a large proportion of your visitors will come through these devices. 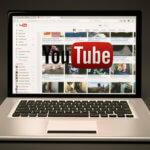 Your website should have a more acceptable uploading speed for 2 very important reasons. The search engines penalise websites with upload speeds that are too slow and they are given a lower place in the Google ranking. If the upload speed is slow, even if your images are impressive, visitors will become impatient and will leave without viewing everything you can offer. If you create your website on Arcadina, in just a few seconds you will have access to the control panel where you can personalise your website from top to bottom: galleries, client albums, home page, colours, fonts, music, buttons, forms… You should give it your personal touch to make it unique. You will be able to upload your images with a simple assistant, edit the texts on all the pages, link to external videos and publish articles in the blog section. But as you are not a computer expert, this process should be quick, easy and very intuitive. Arcadina also has an online support service which will attend to you as quickly as possible (in under 24 hrs, 7 days a week). To get the most out of your photographer’s website use your blog to “attract” new clients and to improve your SEO positioning on search engines such as Google. Take advantage of Social Networks to promote your website, your your blog and to reach more potential clients. Use your sessions to tell stories that your visitors will relate to through “Storytelling”. But don’t stop there. Also include articles that will be of interest to your future clients. Research and discover what the concerns of your potential clients might be and resolve these in your blog articles. Would you like to discover more advice on how to improve your photography blog? >> Advice for creating a successful photography blog. 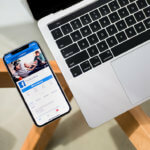 Facebook, Instagram, Twitter or Google+ are the most widely-used Social Networks and they are a great tool for generating traffic to your photography, video or creative website. 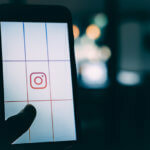 If you use them to share your latest work, interesting news about your website and if you manage to get “your followers” to be interested in the subject, you will create many opportunities for them to share your content and your “name” will move quickly through the Social Networks. Recommendation. “Link your photography website to your Social Networks”. We have left various articles in the Arcadina blog so that you can improve your communication on Social Networks. 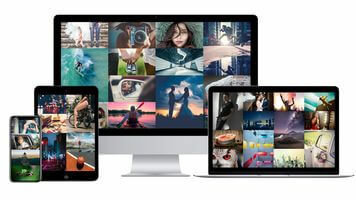 >> Discover how to make the most of Social Networks to promote your photography website. If your photography website does not appear in the top few Google listings, it is as if it doesn’t exist. In order to achieve this sought-after position, keep these pointers in mind. The first thing to do is choose a keyword through which to want to position yourself. Ideally, apart from your photographs, you should include this keyword in the text on all your website pages. 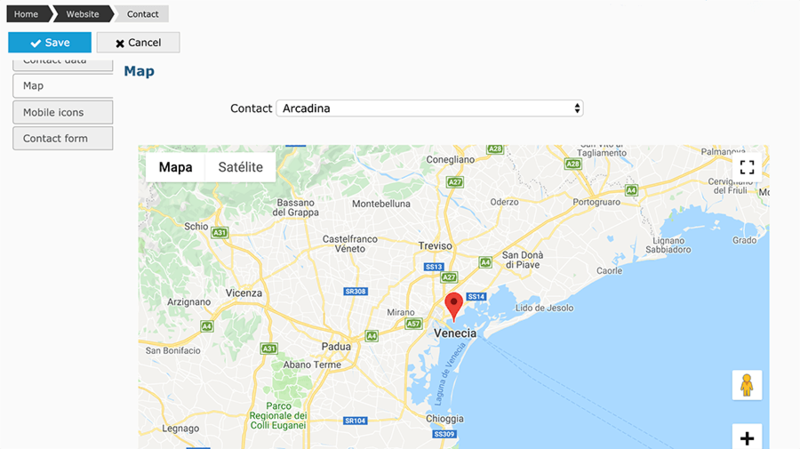 Thanks to all the SEO tools on the Arcadina platform, it will be quicker and easier to achieve a good Internet positioning for your photography website. On our Arcadina blog, we have a special section for you to discover everything about SEO. >> How to improve the positioning of my photography website. If you are aiming to have a website which is solely a “shop window”, you will be losing money every day. 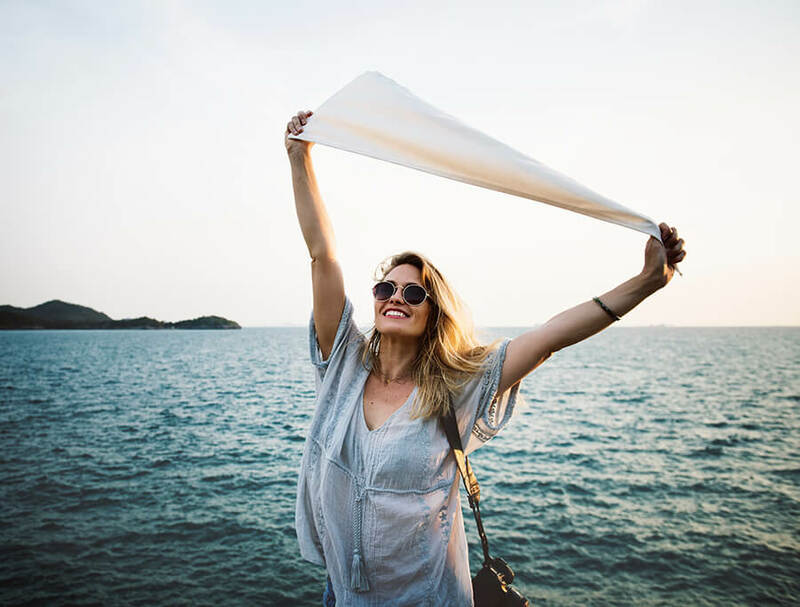 Today, apart from earning money through closing deals, you can also make your photography website profitable and obtain some passive income from selling your images or works in a more automated way. How? By including an online shop on your website where you can sell some of your photographs to the public, or by creating a private client area where your clients can interact with their products without contacting you directly. We have provided some ideas for you below. >> We have separated the Online Shop from the Client Area. >> Selling photos, products and services. >> Private client area for showing and selecting photographs. With Arcadina, in just a few minutes and without the need for technical expertise, you will have your client area and your online shop ready to go. >> 5 ways to do business with your photography website. One of the greatest errors committed by some photographers is not clearly indicating their location and their contact information. 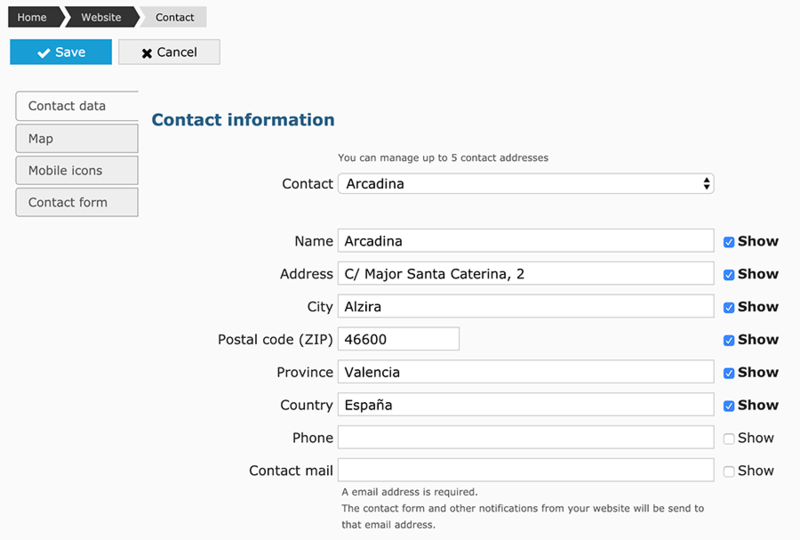 Including a contact page on your photography website is synonymous with a greater number of requests for quotes in your in-tray, and with Arcadina, you will have a range of possibilities to personalise this page. You can personalise this section as you choose. 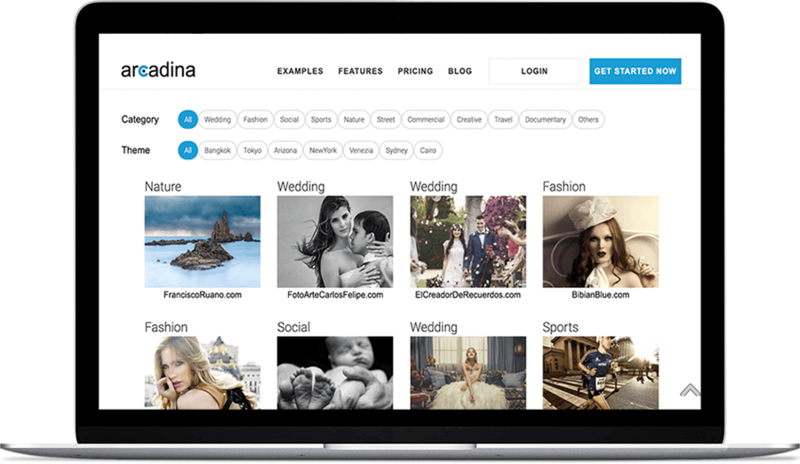 If you are a group of photographers, the Arcadina platform allows you to store your information separately. Including your location is essential for future clients. Even though you may indicate on your website that you can travel throughout Spain, we recommend that you indicate your business location. You can reinforce this information more graphically with a location map. 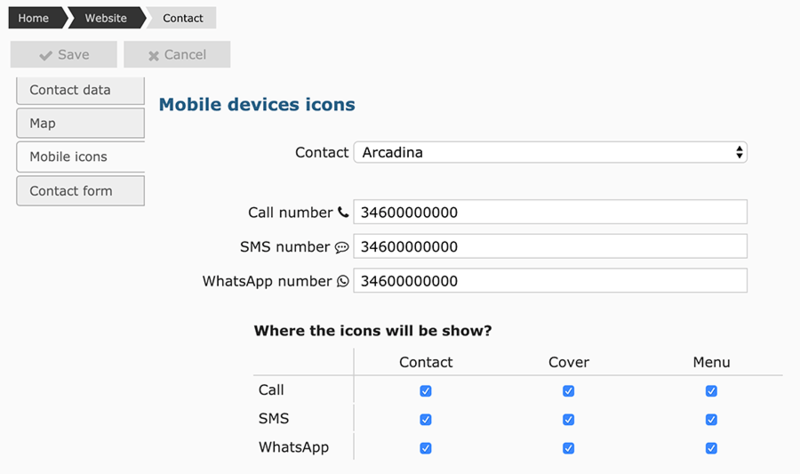 To facilitate communication with your visitors, you could include the icons for telephone calls, SMS and WhatsApp on some of your web pages. Take your time when personalising this section according to the type of service you offer. Pay attention to the number of fields that you include, so that you can offer your future clients a personalised quote based on their replies. All our contact pages also include the verification and legal notice, which is now obligatory. Your website is now ready to go public. Publish it and begin to acquire clients. But beware, ensure that it does not contain errors, empty or incomplete sections, or spelling mistakes. With Arcadina, you can hide the sections that you are still working on. In this way, you can publish your website in hours with coherent and quality content, and then continue working on those sections, like the blog or client area, that you want to fine-tune. You can have a professional website right from the start. Arcadina hopes that this advice on how to create a website for photographers will be very useful to you. Your success is dependent on you, on your actions and decisions, but throughout this journey you will always find help at Arcadina. Think of a domain name that identifies you as the brand. Choose the design that best defines you. Create an intuitive website which is quick to navigate. Apart from adding your photographs, explain your sessions and your way of working. Write your blog so that visitors can get to know you, and to improve your SEO positioning. And be active on Social Networks. Include a client area and an online shop to achieve additional earnings and reduce waiting times. Include a contact page to facilitate communication with future clients. Publish your website. It will be your biggest source of income, so give it the time it deserves. With Arcadina’s specialist website creation for photographers, you can have your photographic website ready and optimised today. There are many photographers scattered throughout the world who have entrusted Arcadina with the creation of their photography website. Try us and create your website with Arcadina free of charge for 14 days.